This is a community service to honor Oshun on her feast day. One candle is lit for each paid $10.99 listing. You may leave any specific peitions or requests in the "special instructions" area on the confirmation of payment page. 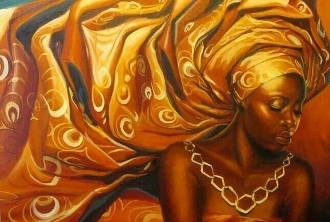 The Orisha of love, who is always seen in a yellow dress, with a large hibiscus flower behind her ear... This oil provides the atmosphere for love, marriage, fertility, laughter, dancing, dates, protection from false love, fun, and abundance! Named "Oshun's 5" because it contains her 5 favourite scents; jasmine, rose, neroli, cinnamon, & anise seed. Anoint yourself and any charms or candles that may be suitable for your workings. Once you work with Oshun, don't forget about her. If you ignore her, she'll assume you are content with your life. Leave her an offering of honey as well, but TASTE IT FIRST! Oshun was poisoned using her favourite food, honey, and she will not trust you if you do not taste it first. Nothing makes Oshun happier than granting her children mates and lovers but be patient and never take love for granted, it is a special gift and should be appreciated. Oshun can see things we can not and if the relationship is not right, she won't have you in it. Thanks for looking!